Timeless and traditional, the Manchester Court Collection pulls together exquisite looks with delicate detailing and a rich tuscan smoke finish. 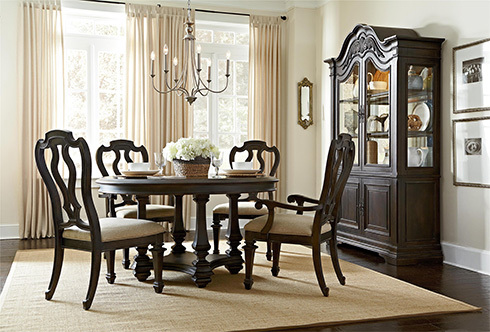 This whole home collection offers pieces to fill your bedroom, dining room, and living room. Eye-catching for sure, the Manchester Court collection exudes a royal look in your home. What about the features? Constructed of solids and veneers, this unique finish combines antiqued cherry with black emulsion glaze. Pieces feature rub-through techniques, worn edges, and distressing throughout. Bottom storage drawers include cedar lining and felt lined drawers at the top. The bachelor's chest and nightstand options feature power strips for convenient charging. 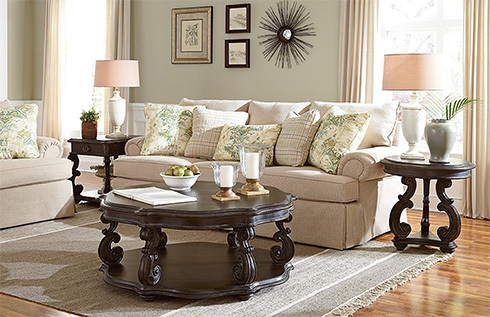 Easily paired with an equally elegant sofa, the occasional tables from the Manchester Court collection offers a classic appeal and don't restrict you when it comes to color. 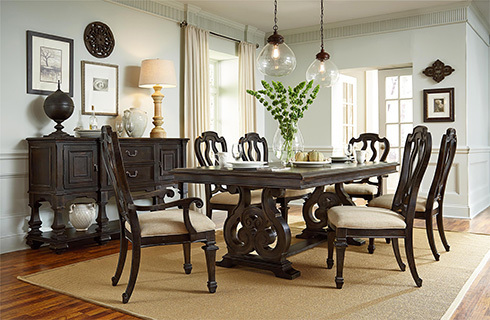 To view this collection in person visit Belfort Furniture's Galleries Showroom. Conveniently located in Dulles, Virginia, our showrooms are home to hundreds of room settings to inspire you and your home.